Beat-Herder, the weirdest, wildest and most wonderful party in the UK festival calendar, announces its first names for 2019, running from 12th – 14th July. After selling out of tickets in record time in 2018, Beat-Herder will once again transform Lancashire’s Ribble Valley into a technicolour party and escapist’s utopia, with an array of 20+ whimsical stages, world-class DJs, live acts & comedians, and surprises aplenty. 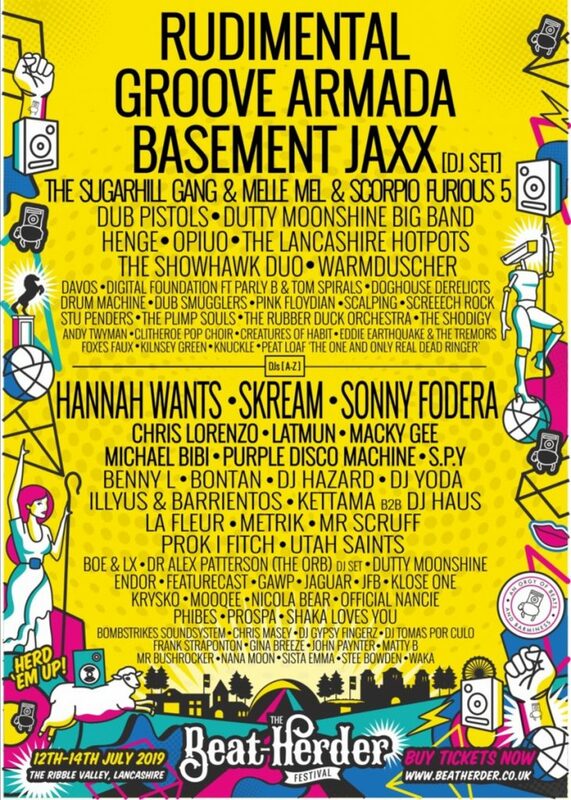 Headlining the main stage this year are the dominating Drum & Bass sounds of widely successful British 4-piece, Rudimental; alongside celebrated dance music pioneers Groove Armada, whose 15 year career has been marked by huge singles ‘Superstylin’ and ‘I See You Baby’ and phenomenal worldwide success. They’re joined by dance legends Basement Jaxx (DJ set), who rose from underground house music sensations to chart-topping, BRIT-award winners, with huge dance floor-pleasers ‘Romeo’, ‘Where’s Your Head At?’ and ‘Do Your Thing’. Reflecting the Ribble Valley’s mystic heritage, The Ring pays homage to John Pratt – a mysterious local enigma who was said to possess the strength of ten men. A 100 foot diameter earth mound accessed via a huge Stonehenge-style entrance, it is the perfect venue to capture the original stadium house innovators, and venue hosts, Utah Saints, whose sampling of everything from Eurythmics to Kate Bush made them one of the genre’s earliest crossover sensations. The very impressive, innovative D&B DJ Macky Gee will take to the decks with a heavy dose of bass; as well as Hospital Records’ DJ Metrik who will be bringing his high-end D&B production to rock The Ring. Combining tight beats and earth-quaking baselines, DJ Hazard also joins the party, alongside multi-instrumentalist, DJ and singer Official Nancie, and the Annie Mac-tipped Leeds duo Prospa. Tier 1 and 2 tickets have sold out. Tier 3 tickets are now available for £150.00 plus booking fee from https://tickets.beatherder.co.uk/. Tickets can also be purchased via monthly or 15-week payment plans. Glamping options are also available. The Beat-Herder Bombassador programme is also open, allowing loyal fans the chance to get free tickets and money-can’t-buy experiences.